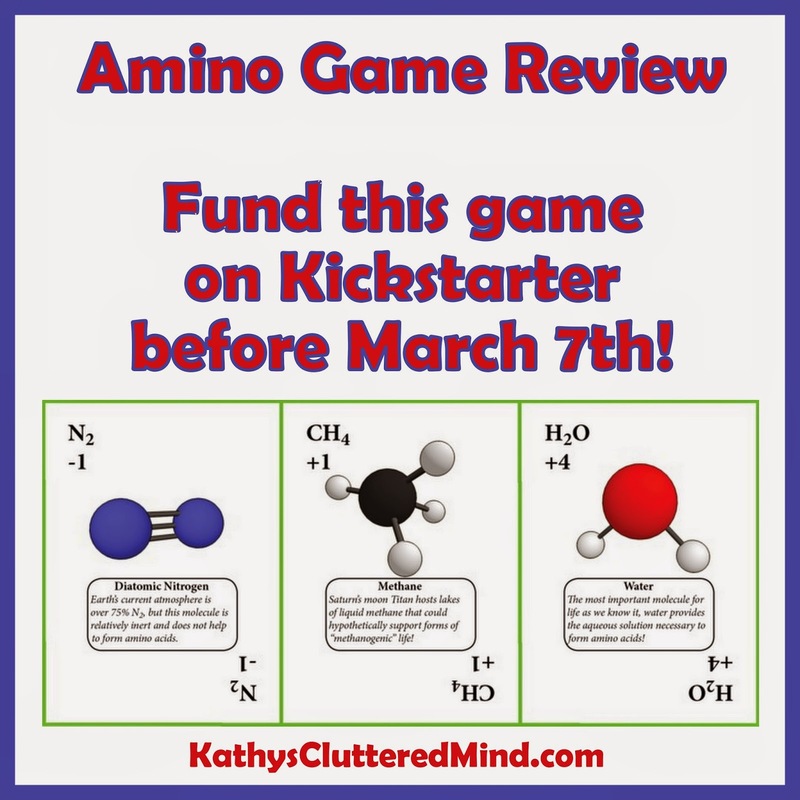 We love games and Kickstarter so of course I jumped at a chance to help the creators of Amino spread the word about their educational, science game. Amino was created by Lauren Woolsey a 4th year graduate student at Harvard. Below I have my personal review about the game, but you can learn even more and watch several videos on the Amino Kickstarter Campaign page. Lauren was kind enough to send me a protype of this lightweight strategy game for our family to check out. The portable game comes in a plastic case and contains 42 playing cards, 6 player reference cards and 2 sets of the game rule cards. You can read the rules in their entirety here (they fit on one sheet of paper)! My favorite part about the game is how quick and easy it is to learn. In just a few minutes you will be playing this simple, fast and fun game. The game can be played in just 30-45 minutes and is designed for 3-6 players. It is fun for both children (ages 7+) and adults. Game play includes bluffing, strategy and memory skills. The object of the game is to collect molecules to form amino acids. It is the perfect game for homeschool and classroom use because it teaches real science! Each card collected represents molecules and environmental effects. The goal is to build an atmosphere that can foster the creation of amino acids. During each turn players complete four actions. First they peek at two of the cards face down on the table, next they play a card in their atmo, then they swap any two played cards or play a card in any atmo and lastly they draw a card from the deck. Don't worry it is not as complicated as it sounds and there is a help reference card to help you remember. Each molecule card has a value (+ and -) for keeping score. There are also two additional cards lightning and sunlight which act as wild cards and bonus cards. The object of the game (besides learning) is to get the most points and put negative-point cards in front of other players. Sounds fun right!! I played the game with my 7 and 9 year old's and had a blast. Since each molecule card includes the chemical symbol, molecular diagram and science fact we not only had fun together but we also learned together too. The only minor improvement I feel the game needs before hitting production is a revamp on the instructions. There were a few things missing from the instructions that confused me a little bit...but thanks to the game playing videos on the campaign we were able to learn how to play Amino very quickly. Fellow homeschoolers, parents and educators you can help make this worthy dream a reality by donating $1 or more on Kickstarter before March 7th! If the campaign meets its goal the game will retail for around $8. Make sure you also visit Crafts, Games and Science Unit to learn more about Lauren's endeavors.